Smart farming through the application of information and communication technologies including IoT is expected to revolutionize the global agricultural landscape, making it more resource-efficient and productive. However, according to the World Bank, about 80 percent of the agriculture produce consumed by developing regions comes from smallholder farmers, and most of these farmers base their decisions on experience and guesswork rather than on any scientific guidance. This approach is not reliable in monitoring and predicting critical variables like the water quality, soil condition, ambient temperature and moisture, irrigation and so forth, which impacts the crop quality, yield, and thus the returns. The agriculture industry and automation suppliers are exploring now opportunities for using IoT and digital solutions for improving yields, profitability, and farming practices. From having sensors in farm and farm equipment, providing real-time data availability and alarms, to advanced analytics for taking corrective and preventive actions, IoT based smart farming will make it streamlined and more predictable. Recognizing the unique needs of the agriculture sector, companies have developed software platforms and apps for yield management, resource management, livestock management, and crop monitoring; including addressing issues that impact crop quality, productivity, and most importantly the cost. Whether it is major seed companies who generally practice contract farming or agriculturists, most would like to monitor the farms remotely. Smart farming solutions would enable users to monitor and control their irrigation equipment, manage farms more efficiently in terms of usage of resources like fertilizers, seeds, and water, and monitor farm conditions in real time. This will help the farmers to detect inconsistencies, reduce operational challenges and to be more cost effective. 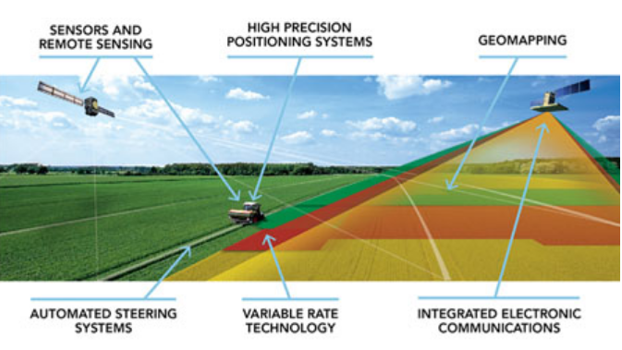 Precision agriculture employs technologies like sensors, GPS, GIS, and drones to measure spatial variability, communicate farm conditions, plan irrigation and harvesting, and thus eliminate human intervention to a large extent. 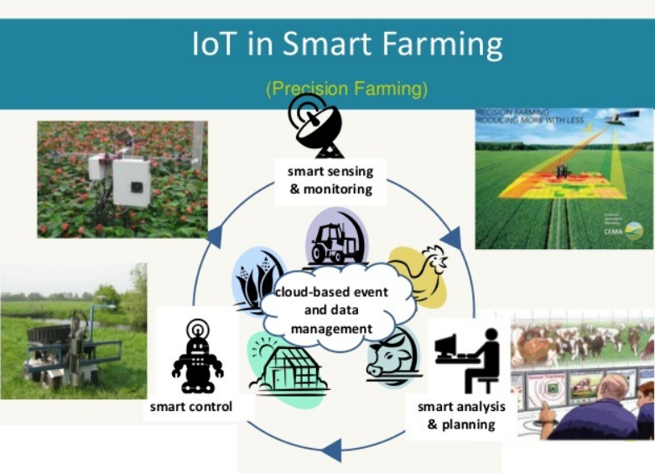 In sensor-based precision agriculture, data from the sensors can be shared with the stakeholders either through local server or the cloud, depending on the reliability of the communication network and internet connectivity. This data is accessed via smart phones, and user-friendly apps can be used to represent it in a simple and clear format. However, to encourage adoption suppliers may have to work on the high initial purchase cost. Major initiatives are being taken around the globe to promote IoT in agriculture industry. For instance, CEMA (European Agricultural Machinery Industry Association) has formed a consortium of 73 partners, including CEMA and individual manufacturers, under the “IoF2020- Internet of Food and Farm 2020” initiative. With an investment of EUR 30 million spread over 2016-2020, CEMA intends to increase IoT usage in the European farming and food sector. Moreover, the US government recently proposed the Precision Agriculture Connectivity Act of 2018 to provide high speed internet access across farms in rural America to encourage higher adoption of precision agriculture technologies. Smart farming also includes efficient use of agricultural machinery. As part of services offerings for these machinery and equipment, suppliers are offering an end-to-end connectivity platform for equipment management. The equipment is fitted with numerous sensors to capture data. Connecting the end devices to the connectivity platform aids in uncovering data for the benefits of various members in the supply chain, including third party services. This data connectivity and sharing is bi-directional, and thus inputs are given back to the end users i.e. 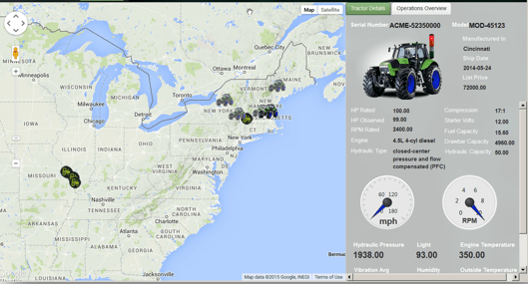 farmers for optimizing their equipment performance and controlling costs. For large-scale farmers in developed economies, transiting to such a model is more feasible compared to smallholder farmers in developing economies like India, where the farm mechanization levels are low. To boost mechanization in farm sector, companies like Trringo (a Mahindra & Mahindra venture), and numerous other start-ups in India are offering agricultural machinery on rental-basis. This market is expected to be around $2.3 Billion, and going forward the use of ICT and IoT -based technologies to remotely monitor and manage these assets is going to be significant. As the number of users increase, equipment lenders would need a connectivity platform and related services to manage their growing agricultural fleet. Amruta’s main areas of focus are automation systems and solutions for process and hybrid industries, covering both India and the worldwide market. About ARC Advisory Group (www.arcweb.com)- Founded in 1986, ARC Advisory Group is a Boston based leading technology research and advisory firm for industry and infrastructure.